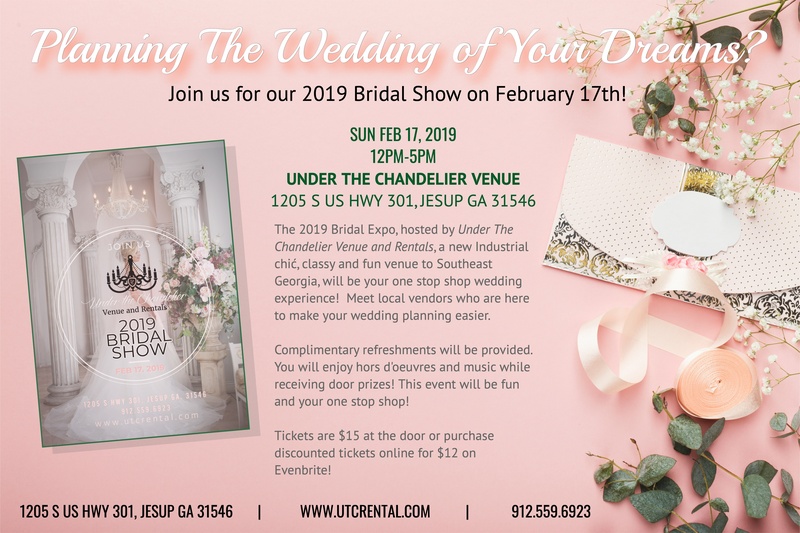 The 2019 Bridal Expo, hosted by Under The Chandelier Venue and Rentals, a new Industrial chic, classy a nd fun venue to Southeast Georgia, will be your one stop shop wedding experience! Meet local vendors who are here to make your wedding planning easier. Complimentary refreshments will be provided. You will enjoy hors d'oeuvres and music while receiving door prizes! This event will be fun and your one stop shop! Tickets are $15 at the door or purchase discounted tickets online for $12 on Evenbrite!